Editor’s Foreword: During my college years, I used to swing by the West Berkeley Public Library on University Avenue after shopping at the nearby art stores for my studio projects. I remember its dismal entrance, dim lighting, and run-down furniture squeezed into tight quarters. 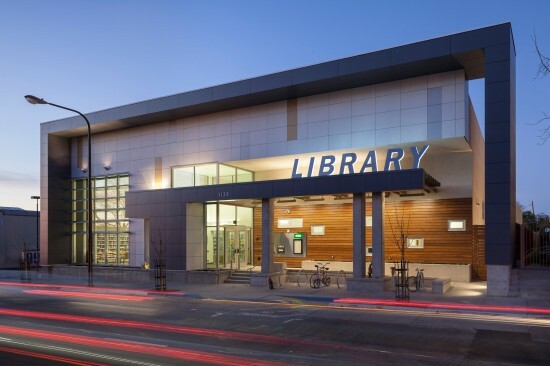 I’m so excited to learn that it has been replaced with a beautiful, modern, and green building, which is the first zero net energy library in California designed to have a net zero annual energy bill. Currently the library is undergoing ZNE verification with the City of Berkeley and the commissioning agent. Verification is a year-long process in which the monthly reports from the energy dashboard are reviewed. 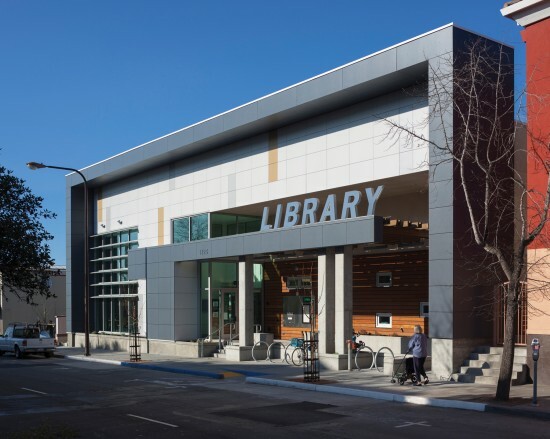 The West Berkeley Public Library (WBPL) is a new 9,339 square foot structure located in a vibrant mixed-use neighborhood of Berkeley, California. The project cost is $7.5 million and was completed in October 2013, under budget. The facility is designed for a code maximum of 252 occupants. The new design gives the library a prominent position on the street, increasing its visibility in the community. The WBPL serves a diverse population and features programs for adults, teens, and children. 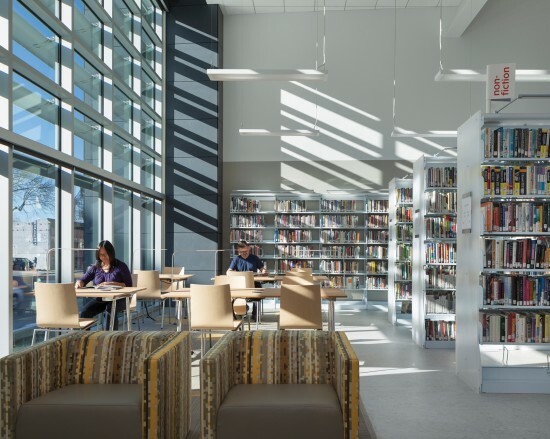 The library’s large collections of Latino, East Indian, and Asian material reflect the cultural diversity and needs of the neighborhood. In 2009, the City of Berkeley published its Climate Action Plan, seeking to reduce its Green House Gas emissions to 33% below 2000 levels by 2020. Upon auditing its building portfolio, the city quickly realized that the only way to achieve this goal would be to have all new city buildings achieve ZNE performance. 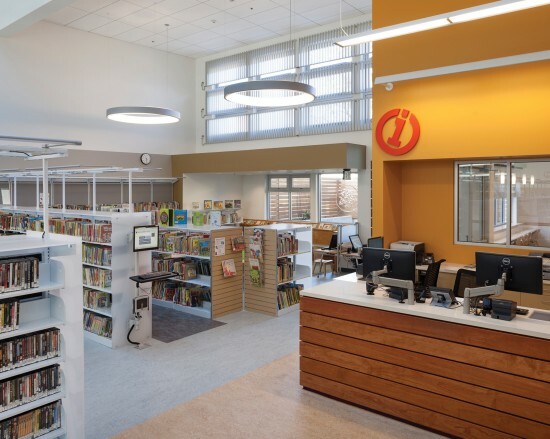 The city decided to begin with a library funded by Berkeley residents under a bond issue and issued a RFP. Harley Ellis Devereaux prevailed as the winning design team due to the strength of its proposal for a ZNE design — the only ZNE proposal received by the City. In addition to being responsive to Berkeley’s policy objectives, the proposal also addressed State of California ZNE policies, which call for all new residential and commercial construction to be ZNE by 2020 and 2030 respectively. PG&E, a large utility serving northern California, launched its ZNE Pilot Program in 2010 and selected the WBPL project as a ZNE case study. PG&E provided funding and became a partner in supporting the analytical and modeling work for the project. Challenges included the tight urban setting and high traffic area. 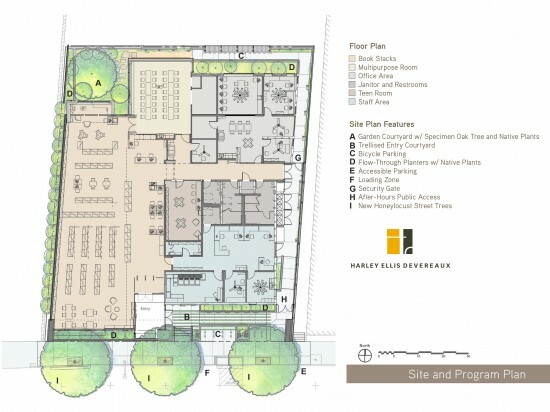 Through an exploration of various design strategies, the team came up with an innovative design balancing the needs of the community and site restrictions with its energy efficiency goals. The WBPL will have a net zero annual energy bill each year and a zero carbon footprint. 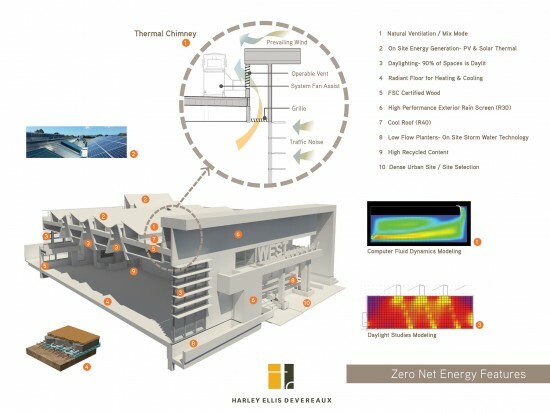 The Zero Net Energy (ZNE) approach had a profound impact on the design process. The starting point for the entire design was the building’s roof. Through modeling, the design team determined the optimal roof configuration and designed the rest of the building to maximize energy efficiency. Optimizing the renewal energy production resulted in a compact volume to maximize an even roof plane for the installation of solar panels. Passive strategies then had to be developed to ensure that the energy consumption of the building would not exceed the energy production on the roof. Specific climate data was analyzed. Solar radiation would be used for photovoltaics, and wind was identified as a naturally available energy source to be used as an engine to drive natural ventilation through the building. Due to noise levels from a very busy front street the south façade could not have operable windows. To make the natural flow of air through the building work, a wind chimney was developed so that the steady breeze from the San Francisco Bay could be employed to blow over the extended front facade in such a way that a negative pressure behind the top portion of the front facade combined with louvers in this area would pull the air through. A small garden forms a micro-climate to the north side of the building so that fresh air for natural ventilation can also be drawn from here. 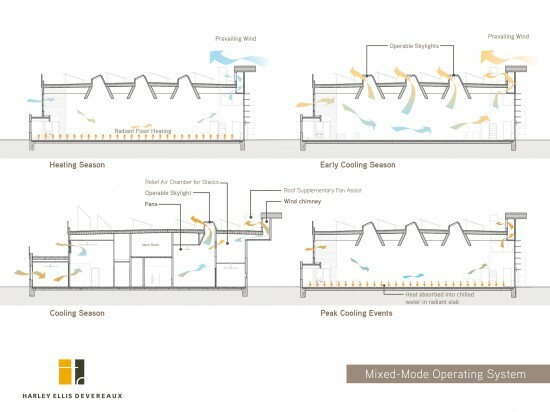 Natural ventilation in combination with a radiant flooring system for heating and cooling as well as thermal mass are integrated into an overall system so that no conventional air handling system is needed. CO2 sensors connected through the beams to the window motors will ensure that the windows open when fresh air is needed. In order to maximize the use of day light, the main front facade receives a large window wall over the full width of the main library space. This south facing glazing is equipped with a horizontal solar shading system. Skylights are north facing to minimize glare impact of direct sunlight. The position of large window walls on the north and south side of the main library space allows for views through the building. The finish floor is elevated several feet above street level providing a sense of safety and a comfortable view to the urban environment. 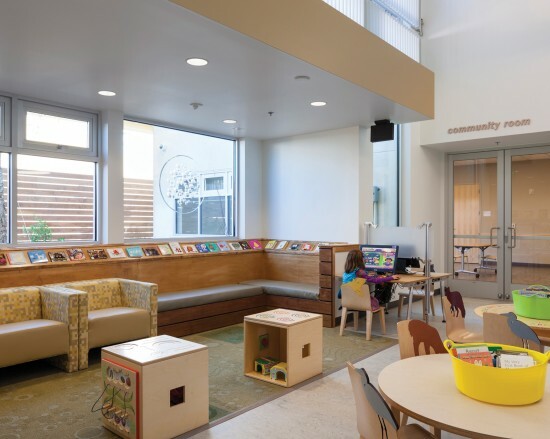 A reading nook in the children area is generously glazed towards the small garden. Internally borrowed light through glazed walls and clerestory windows let internal spaces connect to the natural light. Artificial light sources are installed close to the areas where light is actually needed. Book stack lighting for example is attached to the top of the stacks to focus all light on the books. 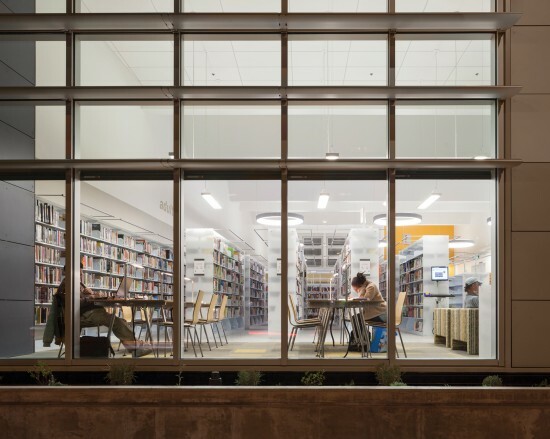 The ZNE West Berkeley Public Library building far exceeds the 2030 Commitment because over the course of a year, it is expected to balance out the energy it produces with the energy consumed resulting in an annual EUI (energy use intensity) of zero. PG&E believes that based on the energy modeling and the increased efficiency of the PV panels, the building may actually be a net positive generator of electricity. The project relies upon the sun to provide renewable energy through the combination of a PV system for electricity production and a solar thermal system for hot water generation for the radiant floor heating. The internal electrical loads used for lighting are reduced by the extensive presence and use of daylight. Large shaded windows on the north and south elevations are balanced with smaller ones on the east elevation. The west facade is a highly insulated solid wall. The ratio of window openings to solid wall is balanced to minimize heat losses with day-lighting gains. To reduce plug loads, the design team selected Energy Star rated and high efficient appliances. The service desk has a laptop charging station where the distribution of laptop computers can be controlled. Since no forced air system is used and ventilation is provided completely naturally, and extensive daylight is achieved with skylights throughout the building, the building can be used even when there is a power outage. Natural gas usage was eliminated from the building design; thus all thermal loads are satisfied with a solar-thermal system. The AIA 2030 Commitment uses EPA’s Target Finder as a reference standard and the EUI target for Libraries is 104. The WBPL’s total EUI is 25 kBtu/sf/year, a 76% reduction from the national average EUI for this type of building. The library is a net positive building, with a Net EUI of 11.1 kBtu/sf/year (Total energy generation of 36.1 kBtu/sf/year – 25 kBtu/sf/year = 11.1kbtu/sf/yr). 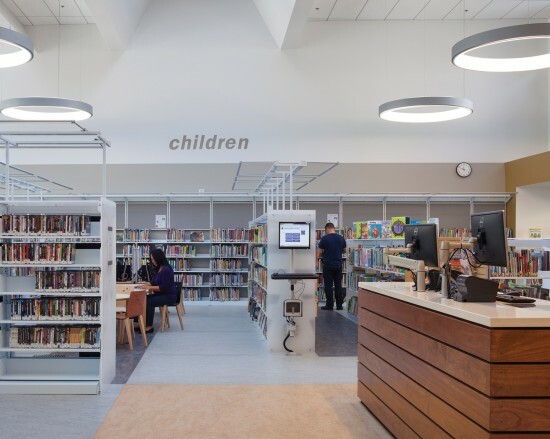 The West Berkeley Public Library occupies over 82% of the site, presenting a creative challenge to meet and balance all stormwater management, landscape restoration, public use, and accessibility goals. On this fully developed urban site, stormwater runoff is filtered, cleaned, and detained before it gets discharged into the City’s storm drainage system and the San Francisco Bay. All roof runoff is collected in flow-through planters integrated into the base of the building. In these constructed planters, vegetation and specially designed sandy soils filter and clean the water. At-grade planting beds also filter runoff from the paved surfaces before leaving the site while providing some ground water recharge. In addition to mechanical and biological cleaning of the water, the planters are designed to detain both routine and major flood flows before the runoff enters the City’s storm drainage system, thus mitigating serious downstream flooding problems. All plantings were selected for their drought tolerance and ability to survive in a healthy condition in the local climate with minimal water-efficient irrigation and seasonal pulses of rainwater. Potable water use is reduced by 58.2% from the LEED baseline. The project was also carefully designed for long-term flexibility and adaptability. The library stacks are designed to be large and airy, in anticipation of needing less books and shelving in the future (with the advent of new media). The multi-purpose room serves as an additional reading room as well as a community meeting room, which can also be used as a stand-alone space after hours. The PV panels are mounted on stanchions as opposed to having the racks mounted directly on the roof. This design allows water flow on the roof to be unimpeded and allows for future technology without impacting the roof itself. Swiss Pearl cement composite panel rain screen system for both thermal and moisture control performance. FSC DreamDex wood rain screen exterior assembly. Cement plaster at remaining areas. 3×8 FSC wood studs at 24” o.c. with Roxul mineral rock wool insulation. The Roxul insulation was selected for its excellent thermal, hydrothermal, fire resistant, and acoustical performance as well as its minimal impact on the environment because of its all-natural materials. R-30 was achieved with two layers of 3.5” of rock wool in the walls and R-40 was achieved with two 6” layers of rock wool in the roof assembly. Dreamdex, a resin impregnated pine wood exterior siding material, was selected for its durability and promise of low maintenance requirements over its life. Unfortunately Dreamdex was discontinued with barely sufficient warehouse stock available for the project duration, thus Harley Ellis Devereaux worked closely with the builder throughout construction to take great care in minimizing waste by careful selection and placement of the siding material. The rain screen details were also modified to decrease its installation complexity, which minimized mistakes, wastage and reduced the amount of required furring channels by 1/3 as well as the amount of Dreamdex wastage. The West Berkeley Public Library does not have any on-site parking. The library’s central location in the neighborhood offers patrons close proximity to public transportation. Bus and train lines are all within walking distance. The library also has adequate space for bike parking. Many of the patrons enjoy walking to the library and shopping in nearby stores. Audio Visual: Smith, Fause, and McDonald Inc. 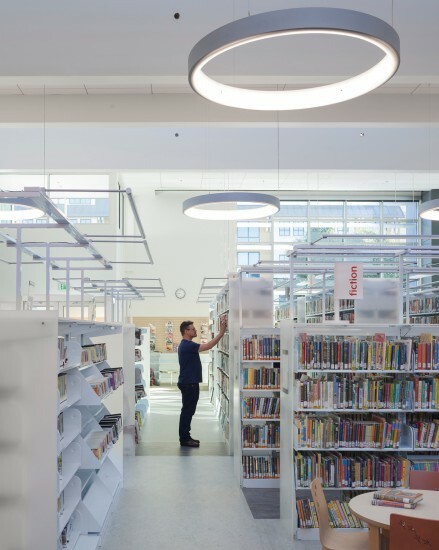 This entry was posted in Industry News, Industry Resources and tagged California, LEED, West Berkeley Public Library on May 7, 2014 by setpointsystems.